8 Reasons why Sales teams need a CRM! CRM isn’t new to salespeople Indeed, the reasons why sales teams need a CRM is well documented and sales managers know what the benefits are of using a CRM system. One of the biggest barriers to successful CRM is if salespeople see CRM as another thing to do and a way for managers to check up on them. Salespeople will be irritated filling in unnecessary data into CRM and completing mandatory fields (and rightly so). But CRM can help to increase sales and save them time… Read this post “8 Reasons why Sales teams need a CRM” to evaluate if your sales team can benefit from a good CRM solution and how to adopt one for your sales team that will work and importantly that they rely on. I have been working with CRM solutions since 2009 and Caltech I.T. has been implementing and helping businesses with CRM since 1999. When CRM was first released there was a lot of talk and research about how CRM can help businesses to generate more sales and save time using CRM. In 2009 many CRM implementations failed to hit the mark due to poor processes and a skewed business focus as reported here in the Economist. Today more companies are knowledgeable about their customer journeys and focus on reduction of churn which can aid a CRM strategy. The CRM software will underpin these processes. So, what are the reasons why sales teams need a CRM and how will they know? How will they know if their CRM isn’t working for them? These points should help to provide reasons to get CRM right for Salespeople – leaving them to do what they love and matters the most… Selling. Check out our 8 Reasons why Sales teams need a CRM! Leads can be described as the lifeblood of any business. Contacting a lead quickly and efficiently with full information is the best way to impress a future customer and showcase how slick your business is and how you would look after them as a customer. CRM helps salespeople to manage leads and ensure that every one of them is contacted in good time, with full information! Do you know if your leads have been assigned? Is the right person dealing with that lead? Is the lead a duplicate or an existing customer? How quickly was the lead contacted? Has the lead been qualified and what is the score? Will the reporting provide a true forecast? Do you know if there are activities on your leads or when they were last contacted? Sales teams want to sell. The more time they are spending thinking about what they need to do today, creating action plans and account plans and pulling together lists of targets is all time they are not able to sell. Can you pull up targeted lists with enough granular detail? Do you know what you need to do and are able to plan so you are proactive and focused on the sale? 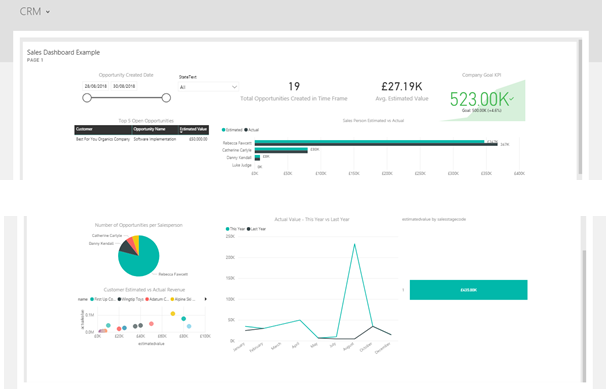 In this dashboard below, we can even see an email where the CRM is telling me that a contact linked to an opportunity is unhappy and therefore the sale is at risk. It also provides a link directly to that opportunity so you check to get a full picture before you respond to the customer; all the while saving the sales user valuable time. CRM will give salespeople increased visibility using dashboards with just a few clicks. Pulling together sales and forecast reports is easy using the right CRM. You can even track your goals for the commission with a graph so you can see if you will meet your target for the quarter. Microsoft Dynamics 365, Office 365 and Power BI provides continuity of data in one solution so there is no switching of applications and no duplication of effort for salespeople. This customer has saved 4 days a month using this reporting solution instead of preparing endless reports and reviewing the data. PowerBI gives an amazing granularity of data. By clicking on a graph you can view the records that make up the data and then start to drill into it. Working with organisations across many different industries we have seen a lot of differences across when it comes to quoting. Often this will depend on how complex the products/services are and the pricing structure. CRM can manage products and pricing including discount and quoting can be made as simple as possible. Salespeople need to have the ability to quote quickly with the right pricing and product information. Cutting down time on quotes not only saves the salesperson time but also will delight the customer with an immediate price. Get the price right and you have cut out any competition by being slick and efficient. One of the most powerful reasons why salespeople can get ahead with CRM is collaboration and the reduction of disparate systems. By having customer regions or customers assigned to a salesperson means that there is no duplication of effort, everyone is joined up and customers feel in safe hands as there is no miscommunication. One of our customers is a franchise so they want to ensure that the franchisees get the leads that are relevant. We have built an application to give them credit checking using MINT from Bureau Van Dijk and the ability to ensure that the lead is only given to one salesperson in the right region once. All data is secure and only the correct team can see their own accounts. This is one example where teamwork is essential. This will no doubt ensure that the customer is speaking with only one franchisee at a time. 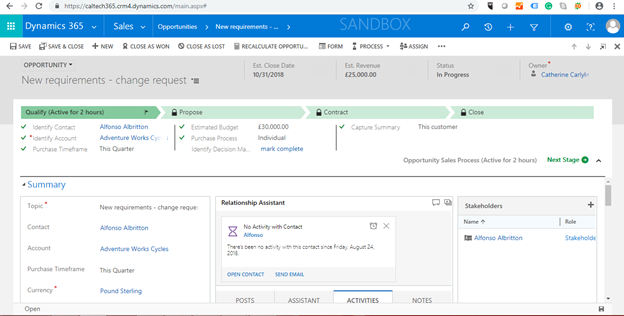 If you have a complex sales process Dynamics 365 can help. Using the ‘Process bar’ you can create actions so that you are driving the prospect through your sales funnel. Indeed, you can use these as markers and you can tailor them to suit your individual needs. See our previous blog here when the Dynamics 365 process bar was released. If you are interested in Dynamics 365 Process Flows and want to find out more click here to see Microsoft’s page. Are you a business that has annual renewals? Or perhaps customer that purchase or need reminders about renewals in various time periods? If you are missing renewals or not following up those opportunities then CRM is definitely for you and your team. Knowing that there is a follow-up process and being able to track every customer will give you a much closer relationship with them. I hope this post has been useful! These are my top 8 reasons why your sales team need a CRM but feel free to comment on our blog or Twitter page and add your top priorities! Already got Dynamics 365? If Dynamics isn’t working for you check out how we can help. Looking to move to Dynamics? Moving your data from your current system is achievable. Give us a call and see if we can help you get CRM right. This entry was posted in blog, CRM Strategy, How to's and Using CRM by Catherine. Bookmark the permalink.